I've been to Jaisalmer twice now, the first time I stayed for a weekend and the second time for a whole week! It is that kind of place, makes you want to come again and stay longer. Jaisalmer is located in the heart of the great Thar desert. The city was built as a fort in 12th Century on top of Trikuta, a massive triangular shaped rock that rose up in the desert. The city’s location was strategic and was a halting point along traditional trade routes followed by camel caravans of Indian and Asian merchants. For more than 700 years, Jaisalmer was gateway of spice and silk routes, connecting India to Central asia, Persia and Arabia. The traders of Jaisalmer amassed wealth and built opulent Havelis, some of it still stands today. Over years as the sea route was preferred over land, Jaisalmer lost its importance. Today Jaisalmer sprawls beyond the fort and is home to more that 50,000 people. Thankfully it still retains some of its character and charms of an exotic trade town. In my own experience, Jaisalmer represents the best of Rajasthan has to offer. I’ve been to Jaisalmer twice now, the first time I stayed for a weekend and the second time for a whole week! It is that kind of place, makes you want to come again and stay longer. However, in this post I will write about my ideal weekend in Jaisalmer. I started with the Jaisalmer Fort, locally called Sonar Qila translating to the golden fort. The fort is the oldest inhabited one in India. Inside is a maze of narrow cobbled streets, squares, palaces, intricately carved temples and clusters of dwellings, all made out of local golden yellow sandstone. Today many curio shops, guest houses and restaurants have set base inside. The fort has only one main entrance, one has to pass through series of large gates to reach the main square. From the main square you can branch out in different directions. Once on the main square you cannot miss the massive 7 storied Rajmahal Palace in front of you. The palace was built as official residence of the royal family, today part of it is open to the public. As you enter you come across room after room of exquisite craftsmanship. The main attraction for me was the panoramic view from the top. I also enjoyed the beautiful Rang Mahal. Next on my list, was the interconnected maze of Jain Temples. In all there were 7 temples built between 12th to 16th century. The intricate carvings on soft yellow sandstone rivalled that of the temples in Ranakpur and Mount Abu. It was almost lunch time, I decided I was going to come back again the next day to explore more. After stopping for lunch at one of the restaurants near the Fort entrance, I prepared to go on a Camel safari for rest of the day. Normally I’d go on an overnight camel safari that would include camping in the desert, but this time for lack of time I choose a sunset safari instead. Camel safaris are fun and exciting, but one has to be aware of the extreme conditions of the desert and prepare for it. I packed a small backpack with nutrition bars, sunblock, camera and a water bottle. I wore full sleeved white cotton shirt and a light comfortable full length trousers. I also wore a headscarf and sunglasses. We left Jaisalmer on a Jeep at 2.30PM, we were to drive to a starting point from where we would mount our camels. 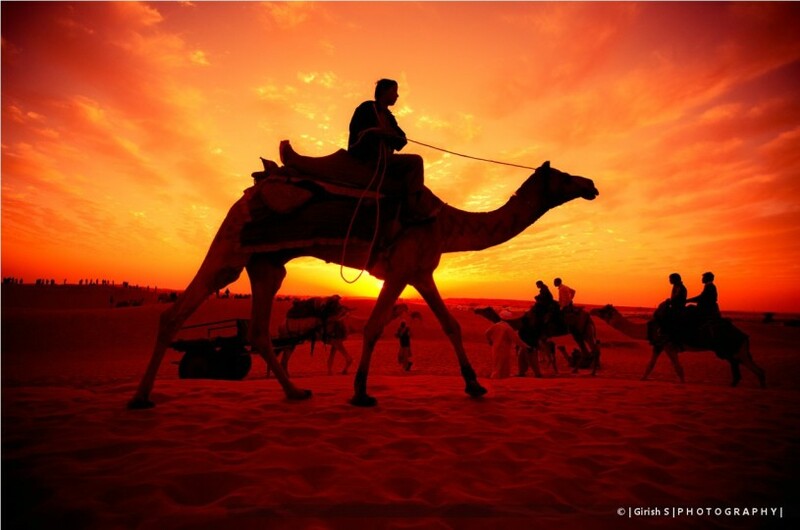 The thought of criss-crossing the ancient trade routes riding Camels excited me! For centuries traders have used Camel caravans to navigate and cross the Thar desert through this very area. What better place to experience a Camel safari? Our first stop was a small Rajasthani village in the desert, we then made two more stops at Kumbalgarh and Badabagh. Finally we arrived at our start point, which was in middle of nowhere. We saddled our camels, sat on them and started our safari. The sun was blazing down on us relentlessly. I had imagined that the desert would be an unending sea of sand dunes. But most of the desert was dusty and arid landscape with lots of shrubs and bushes. We also saw some wildlife in deers and rodents of different kinds. We rode for another 2 hours before reaching the sand dunes. This was our destination, we dismounted from the camels and walked around the dunes. After enjoying the sunset over the dunes, which is in itself a magical experience we drove back to Jaisalmer in Jeeps. Top on my agenda today was to go shopping and perhaps buy some local handiwork. Jaisalmer and neighbouring Barmer have traditionally been known for quality hand embroidery work, block printing and wool dhurries. Most of the traditional artists have given up work now because they cannot stand competition from factory produced products. Based on a friends recommendation I went to Barmer embroidery house, I wasn’t disappointed. The small shop opposite Patwon Ki Haveli is run by the Rathi brothers. I met Jawaharlal Rathi, who has been in the business for nearly 3 decades. The man had a fine eye for antique textiles, infact he has a private collection that can match the best museums. If you are fortunate like me, you might get invited to his home to see his private collections. Exquisite collection of antique embroidery, dowry bags, camel decorations. I left content in my heart having bought a number of very unique items. Since I was in the area I decided to visit Patwon ki Haveli. Without a doubt this was the most magnificent of all havelis in Jaisalmer. It was built by 5 Jain brothers who were brocade and jewellery merchants. The haveli has great view of the fort. Before heading to Jaisalmer, I had watched an episode of the travel show “No Reservations”. What I remember from that episode is that Anthony Bourdain tries Bhaang lassi in Jaisalmer, and he has an interesting experience. I had decided then that I’ll try some when I go to Jaisalmer. Although smoking marijuana is illegal in India, drinking bhaang made from fresh marijuana is legal. In fact the Government regulates its use and allows licensed shops to sell Bhaang in some northern states including Rajasthan. I spotted a shop at the entrance to the fort and ordered a Bhaang lassi. After finishing my lassi I decided I’ll continue my exploration of the fort. Wandering through the narrow lanes inside the fort, soaking in all the sights,sounds and smells was surreal. It was like walking through a living museum, evidence of its rich trading past and its cultural heritage was everywhere. The sun was going to set in another hour, I still had two more places to cover. I left the fort and took an auto rickshaw to Gadi Sagar lake. The Gadi Sagar was till recently the main water source for the city of Jaisalmer. There are several temples built along its edges. I walked halfway around the lake to sit on a ghat and enjoy the sunset. Later I walked a short distance to the Desert Culture Centre & Museum, they have a nightly one hour puppet show at 7.30PM everyday. The Museum is a private effort of a local historian, running without any government support. The show is conducted as a musical with accompanying percussion. Puppetry in Rajasthan was once the favourite form of entertainment. Social reformers and Kings would use them to spread awareness on social and political issues. Today it is a dying art with Television replacing it. The show was delightful, the narrator always started with a story or a message before every performance piece. At the end there was a brief demonstration of how the puppets are operated. The narrator spoke in Hindi and translated in english each time, unfortunately his English wasn’t as good as his Hindi. So while I enjoyed the performance, my friends who understood only english had a hard time following. Head over to a roof-top restaurant outside the fort for dinner. The fort is lit at night from all directions affording a spectacular view. The best spots to catch a good view are the numerous rooftop restaurants outside the fort. This was one of the most memorable moments of my trip, just lounging under open sky at night with a view of the fort. A perfect way to end a good trip! Travspire currently offers experiences in Rajasthan– if interested, you can book here or contact us for a customised trip!